If the temporary blotting out of the sun next week magnifies an inherent weakness of solar power, it also plays to the strengths of energy storage. Advanced energy storage technologies have the ability to charge or discharge at a moment's notice to shore up the needs of the grid. Whether or not the market structures exist to fully capitalize on those abilities is another question. There's little grid storage to speak of directly on the path of totality, where the sun will be entirely covered for a period of 2.5 minutes on Monday. That swath cuts southeast from Oregon to South Carolina. Indianapolis Power & Light has a 20-megawatt system just off of the path. Farther from the line, the sun will be 60 to 80 percent obscured above many of the nation's largest solar plants in California, Nevada and Arizona. The California Independent System Operator expects this to cause a shortfall of 6,000 megawatts that otherwise would have been produced by solar power between 9 a.m. and noon. California also wields considerable storage capacity: approximately 3,000 megawatts, said Alex Morris, policy director at the California Energy Storage Alliance. Some 2,600 megawatts of that are from old-school pumped hydro, with newfangled batteries making up the difference. 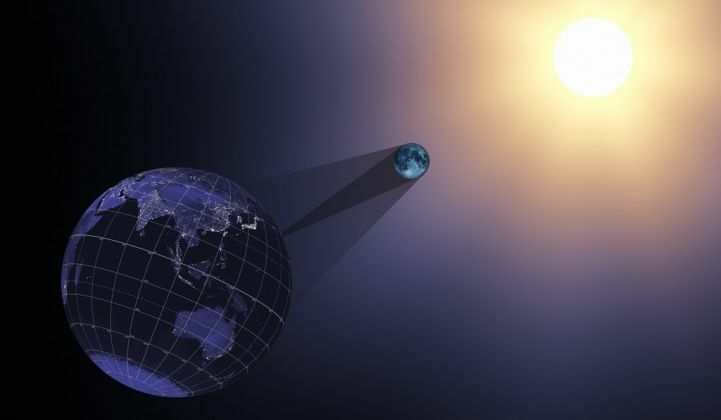 Members of the storage industry hope their response to the eclipse will demonstrate the flexibility of this tool and expand the opportunities for storage to help the grid in future challenges. Dealing with capacity shortfalls, especially ones with as much advance predictability as this one, is no trouble for grid operators. All they have to do is call up additional gas generators to pump out electrons when the sun starts to darken. This can get expensive, though, and involves a lot more greenhouse gas production than the solar would have. The other trick is what happens on the back end. Gas generators spin large metal turbines to generate electricity, and there are physical limitations to how quickly those machines can stop spinning without damaging themselves. Many plants also have minimum run times they need to hit to justify the cost of starting up and burning fuel. Those gas plants will be chugging along to keep the grid running, even as thousands of megawatts of solar generation ramp up in the midday sunshine at a rate of 90 megawatts per minute. CAISO has named pre-curtailment of renewables and limiting the ramp rate of solar's return as potential tools for dealing with the situation. Throwing away gigawatt-hours' worth of electricity, though, wouldn't be popular in California. In some cases, offtaker contracts stipulate a utility has to pay for the generation even if it's curtailed, meaning ratepayers are on the hook whether they get the energy or not. As grid operators balance the primacy of electrical reliability with the desire to maintain economical dispatch, storage offers a middle path. The functionally instantaneous response time of battery storage allows it to deliver needed capacity faster than a gas plant can be turned on. Its ability to both charge and discharge means it can soak up the influx of generation as solar assets come back on-line and gas plants ramp down. "It’s a tailor-made use case for storage," said Ravi Manghani, energy storage director at GTM Research. "For many of these assets, it will be business as usual, but on a shorter and faster time scale." The exact role that storage will play, though, has not yet been decided. "The ISO won’t be dispatching resources any differently from what we do today, absent an eclipse," CAISO spokesperson Anne Gonzales confirmed in an email. "Our market optimization does not favor one technology over another." Storage won't have a special role in dealing with extraordinary circumstances; it will have to compete in the market like any other tool. There are a few avenues for storage to participate. Much of California's utility-scale storage was deployed with a resource adequacy contract, which lets CAISO call the resources up to use for local capacity at moments of grid stress like this. CAISO has "reg up" and "reg down" services for frequency regulation, which adjust the moment-by-moment fluctuations in grid frequency. Storage can compete there to maintain grid stability in the midst of Monday's fluctuations. Storage systems could take advantage of an arbitrage opportunity on the wholesale energy market. If the influx of solar after the eclipse triggers negative energy pricing, qualifying storage units can get paid to charge up on that surplus power. A storage system can't participate in ancillary services like frequency regulation and the energy market at the same time, however, Manghani noted. Distributed storage can bid in for demand response, providing curtailed load as an alternative to firing up more generation. 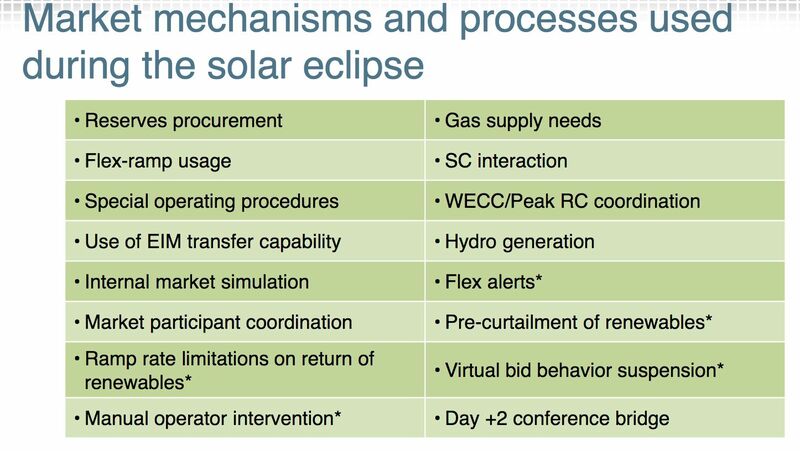 The demand response option puts grid customers in the position of helping manage the eclipse, whether or not they know it. 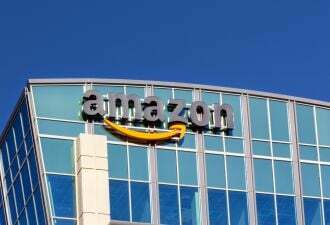 "These resources are bid in by companies that are managing all that complexity, so the customer doesn't have to care," Morris said. "You can provide demand response benefits to the grid without sacrificing much at all." That approach circumvents a certain sort of rhetoric that calls upon the customers to shoulder responsibility for grid stability in the face of an eclipse. "While our utilities and grid operator have all the tools necessary to manage the grid during the eclipse, what if millions of Californians stepped in to allow our hardworking sun to take a break, rather than relying on expensive and inefficient natural-gas peaking power plants?" 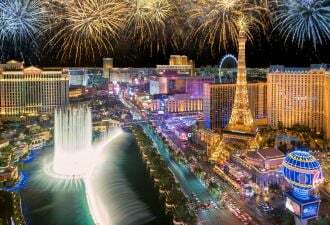 asks a website created for the occasion by the California Public Utilities Commission, before asking readers to pledge to reduce their consumption. Given that ratepayers have already paid to overbuild grid infrastructure to very reliably meet their needs, asking them to sacrifice when the grid comes up against an unusual situation seems like something of a bait and switch. Storage-assisted demand response offers a painless route. Stem is among those companies that plan to bid in aggregated storage capacity for the day-ahead demand response market, specifically for the first hour of the eclipse. That will mimic a sunset, as the solar power wanes. The process for this is the same as the 150 dispatch events the company has participated in with San Diego Gas & Electric this year, said Chief Commercial Officer Karen Butterfield. "The technology -- and the business model -- is something we've been developing since we were founded," she said. "Our technology is super fast; it's split-second fast." For Stem, the hope is that it gets selected to reduce demand, offsetting gas peakers as the solar production drops. 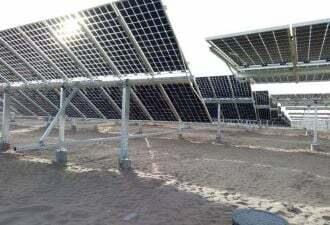 That would showcase the rapid response capability of storage technology, and let Stem tell its customers that they helped the grid weather an extreme event. Companies like Stem, Green Charge and AMS draw revenue from managing commercial customers' energy profile and from performing grid services. They may have reason to charge batteries in the aftermath of the eclipse if it helps the customer save money, but they can't bid that activity as a grid service. "We’re not getting paid for the other half of the coin, which is soaking up the solar power," Butterfield noted. "The eclipse is bringing out this need, but it's a need that exists from May through September or more." Charging up on the plentiful solar generation is much like soaking up the belly of the "duck curve" on a typical sunny day in California. 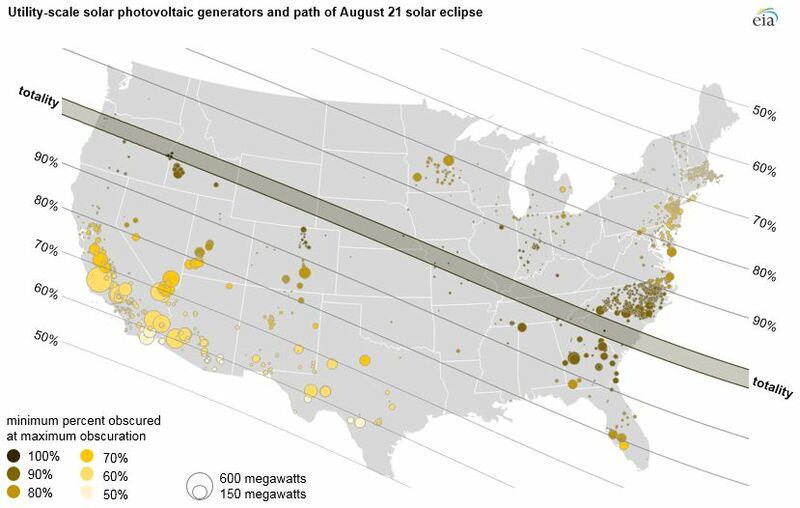 If storage proves useful on Monday, and aggregators gather data about how much they were able to absorb in the aftermath of the eclipse, it could bolster the case for creating a new grid service product. This process is already underway. Stem has been working with CAISO to develop a “load consumption” product to better leverage storage to reduce the amount of solar energy California throws away via curtailment, said Polly Shaw, Stem's VP of regulatory affairs and communications. For all the cosmic spectacle of the sun going dark, the eclipse isn't that different from the ups and downs of a typical day for the evolving grid. Solar power will generate, be disrupted, and generate some more. Grid operators will coordinate a growing menagerie of flexible loads and generators to balance supply and demand. Storage will work around the edges to bridge that gap. "Being reliable, being dependable and continuing to build this reputation of being there when needed is really what comes out of this for the industry," said Matt Roberts, VP of the Energy Storage Association. Energy storage won't be called on to do anything it hasn't already done. Still, the stakes are high, and public attention will focus on the grid in a way it rarely does. A successful showing in those circumstances could pave the way to more responsibility down the road.